In one of the few economic bright spots recently, housing starts surged beating Bloomberg Consensus Estimates. There were hardly any indications before today, but the spring housing surge is here. Today's housing starts & permits report is one of the very strongest on record with starts soaring 20.2 percent in April to a much higher-than-expected annual rate of 1.135 million with permits up 10.1 percent to a much higher-than-expected 1.143 million. Both readings easily top the Econoday high-end forecast of 1.120 million for each. 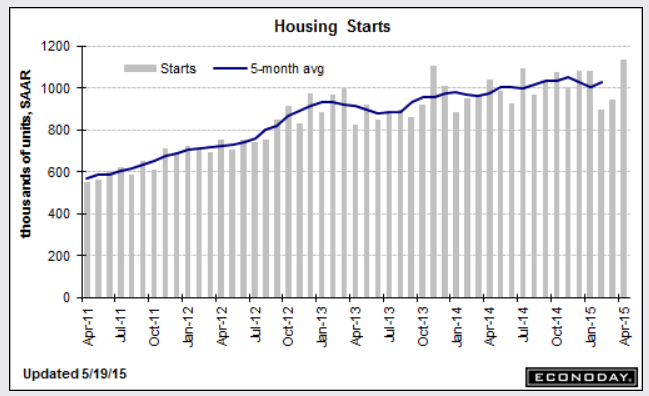 The gain for starts is the best in 7-1/2 years with the gain in permits the best in 7 years. Today's report is an eye-opener and will re-establish expectations for building strength in housing, a sector held down badly in the first quarter by severe weather. Housing starts & permits have been some of the most disappointing data on the calendar, underscoring how weak the new home market really is. Excuses were abundant during the heavy weather of the first quarter but those excuses won't apply to the latest report which is for April. Both starts and permits are expected to show big gains from depressed levels.